Valentine’s Day Dinner at Chessie’s Restaurant. Make your reservations for a Romantic dinner and dine in a vintage railroad dining car at Chessie’s Restaurant. A Romantic Valentine’s Dinner Menu will be offered Thursday, February 14 through Saturday, February 16. 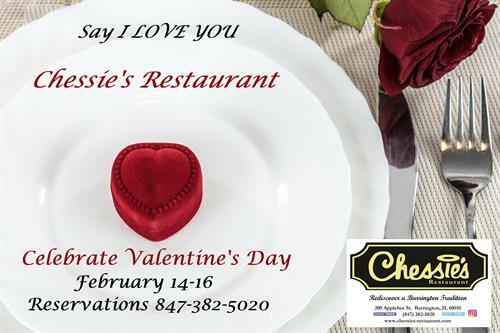 Make plans for lunch or dinner and treat your sweetheart at Chessie’s! Call for reservations at 847-382-5020.